Thursday’s sudden outage of Victoria’s Loy Yang B unit marked the 13th failure of a major coal unit this summer – and offered just the latest illustration of the vulnerability of Australia’s ageing and increasingly intermittent coal fleet. The vulnerability of Australia’s ageing and increasingly intermittent coal fleet was highlighted again on Thursday, when a unit of the newly purchased Loy Yang B brown coal generator in the Latrobe Valley failed in the midst of another heatwave, sending prices soaring. The sudden outage of the Loy Yang B unit is the 13th failure of a major coal unit this summer. Most have occurred with little impact (apart from offering the Tesla big battery an opportunity to show its wares), this unexpected failure came just minutes after the Australian Energy Market Operator warned it may call on some of its 2000MW of emergency supplies to ensure supply as the heatwave swept across south-east Australia. The 1100MW Loy Yang B, which generates close to 20 per cent of Victoria’s energy needs, is owned by Alinta Energy, which bought it from Engie just last year for $1.1 billion – a sale that was only finalised on Monday this week. It is also one of the youngest plants in Australia’s coal power fleet, and is expected to run for another 20 years after AGL Energy’s Liddell plant closes. Just this week, Alinta told The Australian that it planned to use its expanded coal power capacity to aggressively drive down power prices on the NEM. But Thursday’s unexplained outage of Loy Yang B caused the near instant loss of 530MW of capacity, and sent prices soaring in Victoria (to more than $12,900MWh) and South Australia, to a peak of $14,200/MWh. Analysts at the Energy Transition Hub in Melbourne estimate this added $160 million to the cost of wholesale electricity. Prices jumped to a lesser extent in NSW, Queensland, and Tasmania. The failure will be if particular concern to AEMO, which has already warned on repeated occasions that the biggest danger to grid supplies is the unexpected failure of a large fossil fuel generator, now a regular occurrence in extreme heat. It comes as a heatwave is expected to grip South Australia, Victoria, Tasmania and parts of NSW over the coming four days, and amid forecasts for increasing temperatures in future years. Wind and solar may vary their output according to weather conditions and the time of day, but these shifts are largely predictable. It is the intermittency of the big coal generators, and their sudden and unexpected outages, that causes the biggest headaches for market operators, along with events such as storm damage and bushfires. The Bureau of Meteorology has warned of very hot and dry conditions across the country for Friday and over the weekend, particularly in New South Wales, where a severe, five-day heatwave is forecast. Meanwhile, the latest report from the Climate Council has declared 2017 the the third hottest year ever recorded, and the hottest year without an El Niño event. So what happened on Thursday? As temperatures soared in the late afternoon, AEMO issued several “lack of reserve” notices and also warned it may call on its Reliability and Emergency Reserve Trader (RERT) facility – a “strategic reserve” of generation and demand response used as a back-up mechanism. That facility may be invoked later on Friday, AEMO said on Friday morning, saying the standby was needed due to soaring temperatures and the threat of bushfires. It intended to conduct an auction for such capacity to be provided on Friday afternoon. “We have been planning for conditions like today, with a focus on ensuring an operating buffer to manage unforeseen incidents across the power system,” CEO Audrey Zibelman said in a statement. (UPDATE: AEMO announced later Friday that it had activated some of its RERT contracts to keep the system stable). The trip at Loy Yang B was noted by Energy Transition hub analyst Simon Holmes a Court, who tweeted shortly after about its impact on supply, prices and network frequency. It is not clear if the Tesla big battery, which has responded in record time to previous outages at Loy Yang A and Eraring earlier this summer, jumped into the frequency and ancillary services market, as it has done on several occasions this year. But it does appear it cashed in on the energy market, where it can get paid, injecting 30MW into the grid for over an hour as prices soared. This is in contrast to an event earlier this week when Neoen, the operator of what is known as the Hornsdale Power Reserve, charged the Tesla battery when wholesale prices in South Australia plunged to minus $1,000/MWh – meaning that it effectively got paid that sum to charge up so it has the opportunity to sell when prices jumped later in the day. Interestingly, it appears that the diesel generators installed in case of a shortfall have yet to be used. The repeated failures of more than at more than half a dozen major coal units this summer – following numerous outages and capacity losses in last summer’s heatwaves – is causing concerns that the federal government’s proposed National Energy Guarantee will lock in payments to coal generators – in the name of a “reliability” obligation” – for a service they are unable to provide. It concluded that electricity retailers should be required to provide “heat safe” firming power to backup gas and coal plants, such as dispatchable solar thermal with storage or additional PV to reduce peak demand on hot days. This could be buttressed by with battery storage to dispatch into the evenings, the TAI said. But energy minister Josh Frydenberg seemed to suggest that it was all the fault of renewables. In a Tweet, Frydenberg noted the soaring prices in South Australia, claiming that only the NEG and Snowy 2.0 could address the price issues. There was no mention of the prices in Victoria, no mention of the coal plant trip that caused the price spikes, and analysts say it is absurd to suggest that Snowy 2.0 could do anything from South Australia because no link has been proposed. See our separate story on the response to Frydenberg’s tweet. 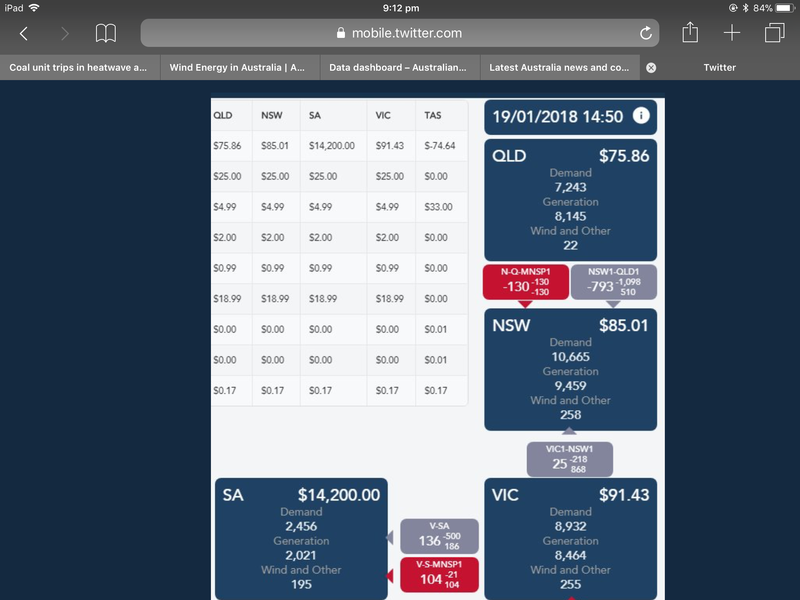 Analysts at IBISWorld noted that electricity spot market in Victoria averaged $905/MWh over the day on Thursday, the highest for January since 2010. It noted that the failure of two generating units at the Loy Yang and Yallourn power stations failed November 2017 had forced Victoria to import large amounts of energy and rely on expensive gas-fired power. “This factor has contributed to recent spikes in the electricity spot market,” it said. My take out of this is the News Corp message. The aspect that in this case it failed and caused the price of power was bidden up to to maximum is never ever told to the public. The estimate by an annalist is this. So $160 Million for just a small amount of time caused by the newest Coal Generator is apparently a brilliant reason to build yet more of these kind of Generators. The problem as i see it is gaming of the energy market as has been rampant for quiet a while the sooner more battery back up is built the sooner these kind of frankly rip off situations do not happen. Mind just remember this is how Coal Fired Generators make their profit the old story used to be we make enough it 3 days of hot summer to cover our costs all year. Yes with these kind of prices one can see why. The sooner this kind of predatory pricing is done away with the sooner we have real cost of energy which should be in the 3 cents per Kilowatt area. Anything other than that and you are putting your faith in the electricity grid providing reliable and affordable energy, which is becoming more of a fairy tale or dream every day. IMO reliability of grid power is irrelevant if you have your own battery with fail-over option. (i.e. battery kicks in when grid power goes down). It is very surprising the SA emergency generators didn’t kick in. They would have made a dent in the price and if not would have made a motza for the SA Government. I smell a rat. Is it possible there is a gentleman’s agreement with AGL that they will only be used to stop the lights going out. It’s not a gentleman’s agreement, it is a formal policy. S.A. Govt made it very clear that these generators would not “play the market” and would only act in emergency. Thanks Giles. A shame IMO that they can’t be used when the max price is reached. Agreed. But if the government owned generators did play in the market, then people like AGL etc might spit the dummy and close some of their generators earlier, saying can’t make so much money. Tricky balance. Hopefully, the Tesla battery will play that role, and more like them. The emergency generators were more in response to decision by Engie not to switch on pelican point when it was clear that supply would be tight. Beyond me why they have any customers left in the state. This is a rotten agreement; as long as leeches control this market there will be no benefit for the consumer… but then, we knew that. What was said elsewhere ‘publicise’ this market! The leeches are boosted by Murdoch. Yes, VOL is a situation where there is at least a chance of system brown or black in the event of a generator failure. Maybe it was too hot. Investigation required? VOL? That’s a new acronym for me. Even though the units are derated by about 30% at 41c, I doubt heat is the reason they didn’t operate. As Giles said, AGL and the SA government have an agreement they are “emergency” units. I was a big supporter of Government intervention like this but the fact that $14,600/MWh isn’t an emergency has me rethinking that support. VOLL (value of lost load) is the old term, now replaced by VCR (value of customer reliability). VCR sets the upper limit in pool prices where expected unserved energy (USE) occurs. They are used synonymously even tho’ they appear to have different economic roots, the first being the economic impact of USE while the second is what a customer would pay to avoid USE. I have to admit that solar thermal plant is looking a bit of a no brainer at this point. Yes there would be issues with covering the whole load with a CSP’s but a 130 MW of generation that can be dispatched from 1 pm to 9 pm during the 7 or so heat wave days a year would be really handy. I supose the issue is, however, that the CSP plant will probably lead to the closure of another generator in the system. NOTE: Renewable energy in the UK is now cheaper than power generated by Nuclear Power Plants. I have noted article which state that renewable energy is cheaper than the power distribution system alone not taking in the cost of the power generated by coal. Just wondering, why isn’t it clear? When will it be clear? The frequency market info was not yet published. That is the ‘second by second’ accounting that you need to look at to see how the Hornsdale reserve responded. What we had was the hourly information which showed the supply, and the fact the that reserve probably made a half million during that hour. I can only find two source of data for Ancillary service costs. On AEMO aggregated monthly https://www.aemo.com.au/Electricity/National-Electricity-Market-NEM/Data/Ancillary-Services/Ancillary-Services-Payments-and-Recovery, and AER aggregated weekly but a month behind – https://www.aemo.com.au/Electricity/National-Electricity-Market-NEM/Data/Ancillary-Services/Ancillary-Services-Payments-and-Recovery. Looks like they need a couple of weeks to finalize payments. Still they have should have real-time SCADA logs. SA has gone to $14,200 right now. Tempting to plug my old bicycle generator into the mains and start pedalling. I could probs make a few bucks off of my electrifying good looks. …but sadly they tripped in today’s heatwave like an old coal station. We used to have an educational bicycle powering 4 x 60 Watt incandescent globes. It took some very strong legs to keep 240 Watts going. So, if my maths is correct that is about $3.50 if you can keep it up for an hour. Still, people go to the gym and pay to do that sort of thing. Instead of the gym junkies running the treadmills, let them hit the bicycles, they’ll still get their fitness fix and at the same time produce electricity. Well there you go…Imma liking the idea more and more. Thanks for the link! The future of work is currently under discussion. Perhaps this is an answer. So the 150 odd MW yesterday and today in the NEM-watch for SA coming from liquid fuel isn’t the diesel backups ? I’d guess that the liquid fuels relate to Torrens Island A’s ability to run on them if need be. SA also has 3 x diesel units at Pt Lincoln and one at Snuggery and Hallett can run on diesel if gas is low on supply. Apparently not. If you have a look at SA on this you can see current generation by unit and history from the previous day. Thanks. I didn’t know where to look for that. It is a no brainer. Nationalise the whole electricity market, stop the profiteers and put some scientists in charge. Tell the LNP to remain with their heads up their bottoms and leave electricity alone. If we returned power generation and distribution to state ownership our honourable politicians would probably flog it off cheap to their mates again. We put the scientists and geeks in control. The politicians have their head up their bottoms and hopefully will not notice. Even with their heads up their bums they have an infallible radar for personal gain. Many economist would disagree with. They are scientist, be they dismal. You’ll be disappointed to learn they’ve long since out grown the tuck shop and now run things round here then. About half of what is taught in introductory economics courses, and in advanced economics courses, has actually been proven false already. It’s got no credentialling standards at all — an economics PhD isn’t worth the paper it’s printed on. It is a real subject, but the problem is, there’s big money in spreading lies about economics, so the big money interests have bought out most of the economics departments at seemingly legitimate universities (like Harvard and Chicago) and filled them with liars and shills. A PHD only means Piled High & Deep. economists are the root cause of all our problems. They are not scientists. “Economics; a social science concerned chiefly with description and analysis of the production, distribution, and consumption of goods and services” https://www.merriam-webster.com/dictionary/economics. I think by that definition they are scientists no? Granted the practice is probably more like dogma. They are listed under arts, not STEM. Mostly because most of their theories are not falsifiable like real science theories. Personally I think they would be falsifiable, but as it’s a really complex field and so much bias is there (people who do well with the status quo have a LOT of power and NO interest in this changing, so influence the discussions a LOT) it will take a couple more centuries or even millennia to change this (unfortunately). The singularity will allow a lot more precision in testing for falsification. Hopefully the methods for removing those who create models to please the powers that be will also rapidly evolve! Hm, I’d rather hoped for advances in AI/GPU processing to enable ever more complex models to be run cheaper and test ‘scenarios’ like they do with weather or nuclear reactions (no idea how many economists/control engineers there are with those kind of skills that can concentrate on this = get paid to do it). So far the tech seems to proliferate electronics stock trading and cementing the advantage of the ruling class more than anything. And removal of flattery will only happen if the monopolies/oligopolies in private hands vanish, which depends on the aforementioned modelling to get enough people convinced (see AGW or smoking kills for how that works, ha) to at least get a chance at having a democratic debate and maybe test this somewhere on this rock. “it’s a really complex field.” You’re not kidding. Yeah, but there are and must be basic principles that would (and do) let us put up something similar to Newtonian physics and we can go from there. But alas, as long as they don’t nail the ‘economic particle’ down (i.e. money units) they won’t get anywhere. And the bias/incentives to not do that are pretty high and complex, so it will take a lot of time, especially as the timescales are decades to observe ‘reactions’. Remember that we went from gold backed currencies to non-backed ones just 60 years ago and no major change has been happened since then. Let’s try to stay in the present. It’s not not like physics. Properly done economics is like *biology*. The basic principles are nothing like physics principles, they’re more like evolutionary principles. A basic market economy has got prosumers as nodes and they interchange goods/services with each other in a big and intertwined circuit. Nothing else needed for basic simulations. For a basic model all you need is something similar to a circuitry simulation tool (I’ve come across some economic simulations 10 years ago by hobbyists, dunno where that is at now) and you’re good to go. The hard work is in the nodes for such a simulation. And with ever cheaper processing power I’m very sure a couple of people are working on this, somewhere. If you could put software/control engineers/economics students together into a class/course you’d be able to get a lot of Masters/Doctors out of it and might even define a new field. Oh, no. Most economics theories are actually falsifiable. In fact, most of them have already been falsified, but this doesn’t stop the Free Market Worshippers from teaching these false theories anyway. This makes economics more like *religion*, another subject where falsified theories are taught routinely. I’m a free market advocate, but this means no monopolies/oligopolies in private hands. And where that is not possible (natural monopolies), it has to be under public ownership + scrutiny what happens with it (land, raw resources, etc.). The ones you label ‘free market worshippers’ are actually (knowingly or unknowingly) worshippers of protected monopolistic/oligopolistic markets. They are better labeled crony capitalists or monopolists. Their interest in a free market is nil. And so far we never had a free market. Anyone who tells you otherwise is making up BS. PS: once we have a free market, we can debate about the social framework that deals with the care/treatment of the people around us that aren’t able to keep up (politics). But that is a separate issue really and not the focus of a market first and foremost. PPS: falsifiability of economic models is very very hard as the real world is so complex and not a laboratory where you can run encapsulated experiments. You would need to decouple a region with like half a million people from the world economy for at least a decade to test stuff IMHO. Anything else can’t really be called experiment, but rather coffee grounds reading as you got way to much noise and interference to make out a clear result. And as I wrote, I hope Supercomputers with a couple of basic AIs as subjects would help with that. Nobody at an Australian University gains a Bachelor of Science in an Economics major – It comes under a Commerce degree. Gee wiz I guess that settles it. Robert, you are being way to kind to Joshie & The LNP. Yes mate ..probably…With all these good comments from good men/women…surely we can whip these ignorant corrupt officials into line and do what they were elected to do – the peoples wishes…instead the they are the puppy dogs of the big end of town…it is sad, very sad. It’s all very well to nationalize the market when Labour or the Greens are in control, but when the LNP is in control, it just means they will loot it. Nobody should ever vote LNP. I don’t believe nationalising the power supply is in the best interests of South Australians however returning it into a publicly owned state asset would be optimal. intentional? I mean, it’s said there is a lack of competition in the WEM. Does Alinta own other generation and/or peaking plants? So what’s causing the spike in prices today. Has a coal fired generator failed again or is it a lack of wind? intraday spikes are often due to the market. electricity is bought in hourly brackets and get turned off and on accordingly. during those times prices spike or fall until the frequency is adjusted again. those spikes can be as big as a tripping plant. A very timely article; just when the opponents of renewable were blaming the high prices on SA’s renewables (apparently without any supporting evidence). As someone else said, the promised Port Augusta solar thermal power station with energy storage is the sort of thing we need at a time like this. Sorry Mick; I don’t understand the question? Some useful long term load- shedding could be achieved if network owners and rail networks managed their lighting properly. Commuting between NSW Central Coast and Sydney, in see literally hundreds of platform lights operating in full sunlight. Multiply this tiny patch across NSW and the load must ne ENORMOUS. Hopefully change over to LED street lights ? That and turn the bloody lights off when there not needed. Cityrail have largely done that but controls are poorly set up and or maintained. Excess heat when sun shines on them while running leads to early and expensive degradation…poorly executed projects. Better positioned and with decent reflectors to reduce losses. WHY oh WHY is there a need for State & Federal Politicians to yell at each other & us the poor end user of the Power System when all we need is a stable Power Grid from a stable renewable source? Where is the thought that the Promotion of Electric Vehicles by way of subsidies to allow a NEW Battery Power Resource to be made available. With EV’s sales heading forever upwards [ in the rest of the world ] but not Down Under this Battery Power Resource from 40, 60, 85 & 100 KWH EV Batteries are being used internationally to stabilise Power Grids elsewhere. The new 2018 Nissan Leaf in the UK is working with a Power Supplier to make all Nissan Leafs available for OFF Peak charging & HIGH Peak return of the power back to the Grid just as in South Australia where it is reported that the TESLA Battery farm charged its batters at a cost of MINUS $1,000.00 per MWH & sold it back at $11 to $14,000.00per MWH. Maybe if the Federal & State & Governments sold off all of their Internal Combustion Fleets & replaced them with EV’s Cars, Trucks & Busses which would then provide another LARGE Battery Resource then maybe they would not have to spent $2 to 4 Billion on Snowy 2 & avoid the potential Environmental Disaster with water contamination proposed for the material form the umpteen KM of tunnels being Proposed. Oh maybe they could follow the lead of more progressive countries & provide an Incentive for persons to purchase all Plug In Electric Vehicles. Have the Politicians & Regulators not been seeing overseas trends. It is reported that in 2017 in Norway 52 % of all vehicles soled were EV’s & a city in China now has 12,500 ALL Electric Plug in Busses. The change of the Taxi fleet is next in line in that same city to go ALL Electric. 4,000 you drive EV’s in Paris. While in little old Perth no sorry WA there is less than 200 yes TWO HUNDRED EV’S. Where are our visionary leaders? Do0 they not see the future & 2018 is spruiked as being the year of not the Horse or Rabbit but the EV. Regards, Laurie now 77 years young. You really shouldn’t put all your details on the net.. it’s not a safe place. Many thanks for your advice. My details are all over the web already as I run two – 2 websites so while I agree with your co0mments that the web is not a safe place I am already exposed. The Power Grid I am bringing to peoples notice already exists in a number of Countries & will be a fact of life for many in the not too distant future. This is in the future but the future is almost now. 82% of those chargers reside in China. China is the ELIPHANT in the ROOM no WORLD in respect to EV’s. Chinas output for 2018 I understand is 1 to 2 million EV’s. Last year they produced around 27 Million Internal Combustion Vehicles so EV’s are still not a high % YET. Many Cities & even Countries are planning to eliminate the Internal Combustion Vehicles by 2040 or even sooner in some areas. Will some people lose out with the move to this disruptive technology. YES & a very BIG YES. Oil Companies Shipping, ICE Vehicle Manufacturers & Service People. Will the change be FAIR? Probably not, but the Avalanche of NEW EV Technology is already in motion & I doubt it can be slowed down or stopped. More likely the change will be much faster than the pundits speculate. Interesting points Laurie….. and don’t worry about safety. As long as you are gushing about the benefits of anything renewable you are more likely to be killed by love on this site. EV should be a major part of the grid, and the price of these should be subsidised in some way. Norway has been very successful with incentives and subsidies. China can see the benefit of transport electrification, so there are certainly precedents available to formulate a decent policy. The vision is of a fully electrified transport system, completely integrated with the grid. EV would provide battery storage capacity to stabilise the grid and may at times, provide the actual “transmission” of electricity from grid to premises. EV would also have a demand management function – soaking up excess electricity generation and providing dispatchable electricity when needed. EV would use local energy sources and avoid the use of imported oil based energy. Subsidies should be designed to achieve this vision. 4. Give generous import/export arbitrage rates to encourage demand management and loadshifting. As Laurie points out passenger EV have battery capacities from 40 to 100kWh. This gives the vehicle a decent range, but the average commute is far less than the maximum range. The selling point – ie range – of the vehicle is also the expense of it and is also the unused but useful part of the vehicle to provide grid storage. Arbitrage opportunities is one way for the grid to gain access and use of this excess battery capacity. A cost sharing option is another: if the grid pays for a percentage of an EV’s battery it can access a percentage of the battery’s capacity for grid services. Imagine 10 000 cars with this kind of battery access for the grid: on average say 30kWh storage capacity per vehicle. Battery cost component say $300/kWH for 60kWh/vehicle = $18000 total cost of scheme: $180million storage capacity available: 30 x 10000 =300MWh. Not too shabby. The vehicle owner gets their range and the grid gets its battery storage capacity, and prevents grid-defection and creates a new market for its juice. The government would get a better balance of payments with savings on oil and would get the advantage of a growing EV market. So when windd power dropped 750MW today what generating source picked up the shortfall? Was in the article, backup, probably mostly gas. Did it drop off precipitously? And how much did the price go up? Because the coal plant caused a 150 time markup, what did the gradual loss of wind do to prices? Look at http://nemlog.com.au/region/sa/ – the price spikes corresponded to binding of Heywood most like due to other lines having issues leading to local instability. During the transition phase yes. The grid we inherited/built so far isn’t designed to have (enough) water/batteries/biomass as renewable backup in case the predictable intermittent solar/wind is ‘under-performing’. So that means the network couldn’t get the power to where the demand (generation shortfall) was. We call it the NEM, but it’s not a national market if you can’t get product to consumers in another state. Part of the problem is the market power of generators who have a vested inrerest in creating periodic shortfalls. Long-term shortfalls are addressed by new investment, but short-term price spikes will keep happening and incumbents realise excess profits until that investment arrives. And ultimately this is a “roads” problem… do you build roads so everyone can drive anywhere at peak rush hour in minimal time? No, you try to manage demand and build for a sensible percentile of demand scenarios. A perfect illustration of the stupidity of Snowy 2 and of the need for storage in SA. In the 1960s I was living in a house of the grid with battery storage and wind generation. And when the load increased and the batteries and Dunlite couldn’t supply it you started the Lister. The alternative was to run the Lister continuously but you chose wind, when it blew. So you’re a renewable energy pioneer, well done. We need a new term to describe the COALitions beloved “good ‘ole coal” power sources and, since ‘intermittent’ is already taken we should be calling them “flakey” to best reflect their tendency to give up, just as they are needed most. We could then say : Energy Minister, Josh Fraudenberg, a keen supporter of flakey generators, blames renewables yet again for the failure of another coal generator. That is *half a million dollars* to Tesla and Neoen (not sure how they split the profit) from *less than a week’s work*. This battery is going to be printing money for a while. If I owned a coal fired power station I would cut production by 20% in every heat wave and make a fortune. This is a scheme Di Natale must be proud of. I was watching a YouTube Video on DISRUPTIVE TECHNOLOGIES & the presenter was refereeing to EV’s & all the infrastructure currently in place that the increasing number of EV’s will impact. He used the term – EV’s are in effect POWER STATIONS on Wheels. Not sure if he was referring to NOW but he stated that in Norway at some date that if all of the EV’s were connected to the GRID they would be capable of providing 50% of the power requirements of Norway in a controlled environment. If this is in fact CORRECT where is the Australian & State Governments on this possibility. Support the introduction & use of EV’s, sorry I now believe that the term is or should be referred to as ZEV or Zero Emission Electric Vehicles to address our Inconsistent & High Priced Power GRID. More INCENTIVES required & more investigation of ZEV’s to address Australians increasingly problematic Power GRID issues from all levels of Government – Local – State & Federal. The automobile Clubs Australia wide appear to be the leaders in the installation of Charging Stations. VW in the use is planning to install 2,800 charging stations across the USA over the next 12-18 months with 75% located at business premises for staff use. Major Shopping centres in the USA e.g. WALMART & Others are installing charging stations & providing FREE ZEV charging to attract patrons who are a t this stage mainly HIGH Flyers with TESLA ZEV’s. When will the MOB Down Under realise that this movement started years ago with the Nissan Leaf in 2009 & other manufactures in 2011. It is time to wake up that this year 2018 & in future years ZEV or Zero Emission Electric Vehicles will be the NORM & not the EXCEPTION. Internal Combustion Engines at heading the way of the Buggy Whip. Absolutely & without any possibility of a reversal. I have registered a new Business Name. SSE – Sustainable Smart Energy & the Logo shows the SUN in all its working Glory with the wording EL SOL Good for & guaranteed for around 5 BILLION YEARS. I have a 1 KW 5 panel Solar Array on my unit installed in 2010 & I am now increasing that system with an addition 18 panels which are more efficient + I am adding a TESLA Power Wall 2 to the mix. My plan is to add an SEV to my plan in 2019 with cables running to my garage to power the ZEV form my Solar Array with the ability to sell power back to the GRID if & when applicable. Power by EL SOL !!!!!!! A good solid achievement from the battery – managing to keep a steady 30MW for a couple of hours. Back of envelope (well, spreadsheet) they made over A$700,000 over 5 days – they’ll be wanting lots more trip events to make up for the much lower income from the first couple of weeks of the year, which was about A$60,000: A$1.5m p.a. isn’t going to pay for it. More back of envelope: the Heywood interconnector supplied over 20GWh net between noon on the 16th and the end of the 20th. So it could have been replaced by about 160 batteries. Call it about 2 Snowy 2 schemes by cost. Are you forgetting that this battery is 70% for FCAS and 30% for the wholesale market? So perhaps the interconnector could be replaced by as few as 48 batteries (not 160)? And in fact far fewer still when accounting for the new CST plant and other renewable-with-storage generation that will soon be online in SA. Also, 160 times 30MW is way over the maximum delivery capability of the Heywood interconnector. It is the quantity of energy stored that is the defining factor, not the power delivery rate. I note that aside from some obvious testing, there has been no sign of the 70MW delivery capacity being used, nor the fast charge capability (which seems to be limited to 80MW in tests). I don’t have an explanation for that. Was only making the point that most of the battery power is intended to be kept in reserve under contract to the govt for FCAS purposes. The $60,000 made in that first fortnight is ‘additional’ to the govt contract for FCAS. Correct me if I’m wrong. “A$1.5m p.a. isn’t going to pay for it” sure but then add to that the govt FCAS contract. Generally speaking from that cumulative graph’s tendency to charge up and wait rather than discharge frequently it seems there is a lot more room for more storage in the market (the non-FCAS market), to have more competition for the sub-extremes of RRP to charge/discharge. Is there an option to put another line on that chart for the output of the nearby wind farm? It’s a nice question how much is earned under FCAS. I don’t know the answer in the Australian grid context (and it seems to be a traded spot market anyway): I do know that in the UK, Enhanced Frequency Response saw batteries offering as low as £7/MW/h for 8760 hour availability, with penalties off that if performance doesn’t meet exacting standards. Very even across the 3 phases, with Phase 2 actually delivering marginally the lowest performance. Output is pretty stable when the wind is strong enough, but it can become quite choppy in some conditions, and it can ramp up or die down quite fast as weather systems move through. Output can fall to nothing, with even a small load on the grid to keep the turbine shafts rotating. I’m trying to figure out just what the battery is doing: I had a look at its charging/discharging regime against the output from the Hornsdale wind farm (all three phases now operational), because its pattern of charge and discharge seemed very intermittent, as if it was in a stabilisation role as Statoil plan to do with their Hywind offshore windfarm. It really isn’t the answer: the windfarm was producing a steady maximum output for extended periods, while the battery added volatile spikes on top. At best you could say that the battery made an attempt to provide some rather irregular output when the windfarm was producing almost nothing. There is no close tie to price trends either (although the battery mostly manages not to be charging when prices spike upwards). Any sensible interpretations very welcome. It’s ironic how they keep saying renewables cause instability yet it’s the large plants that are the issue.. even in Switzerland large plants are unreliable and breakdown unpredictably. Plus nothing can beat batteries in terms of the control and reaction times that are very useful in those instances. That trip was caused by a network fault on the 500 kV system that back feed into LYB and thus the trip wasn’t caused by the power station in question. You can find the info on AEMO web site. As for the cost to the industry, as most Retailers are in hedge contract it would only be a small % that would be sold in thus the figure are a little over the top.